The grunge killed or put most of the 80's melodic hair rock bands on hold in the beginning of the 90's and now another great hard rock band has found their way back to the studio. Trixter did not hit the biggest charts with their self-titled debut in 1990, but joined a tour with Poison, Warrant and Scorpions in 1990-91. The second album was released in 1992 and another tour together with KISS followed, but the winds of rock changed and the band quit in 1995. 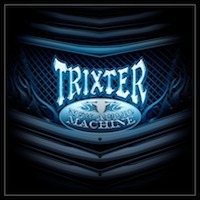 Since reforming the band in 2007 Trixter has released 'Alive in Japan', a live concert CD featuring two new songs and a Best Of CD with all the hits re-mastered. Now they are back with the stunning album 'New Audio Machine' that contains songs in the 'Giant' and 'Hardline' class. Awesome melodies, very strong songs and a professional image on a level I didn't expected from a band, which reunited in 2007 and haven't been in a studio since the cold war ended. And they really have made their homework well, because this rocks really, really well occasionally. In the opening track 'Drag Me Down' it starts acoustic and calm, but explodes into one of my favorite songs this year (so far). I feel similarities with Whitesnake's new album with bluesy slick guitars and an American vocalist version of Mr. Coverdale, but even better in many ways. 'Get On It' is rockier and got harder guitars and great melodies. Smashing tracks makes me spin of joy and blow my mind away with charming guitars and true classic American Hard Rock tunes. The first 4 tracks are top of top class, but some mediocre songs in the middle drags the score down several steps. In 'Tattoos & Misery' they have a radio hit with amazing melody and great guitars that attracts me to dance with the wife in the living-room spontaneously. Another strong track worth mentioning is 'Save Your Soul', which is an all American rock tune with all the ingredients you want to hear if you are a melodic rock fan. Sadly some of the tracks are a little to weak and tasteless to get it all the way to the top, but there is still several of golden gems to pick from and save in the Ipod. Trixter: Peter Loran (Vocals, Rythm Guitar), Steve Brown (Lead Guitar, Harmonica), P.J Farley (Bass), Mark Scott (Drums, Percussion).